Physics Instructor, Mark Ellermann, practices CPR on a dummy. Most people who work or attend classes at NTCC enjoy its rural setting. But, how many of them have ever considered how much time it would take for an ambulance to arrive on campus? EMS Instructor Russell VanBibber has actually put a lot of thought into the issue and has recently started offering automated external defibrillator, CPR and Stop the Bleed training for college employees. The four-hour class offers three training sessions that include AED and CPR for adult, child and infant, Stop the Bleed in a major illness or injury, and how to respond to events such as active shooter/stabber and mass casualty incidents. VanBibber said this particular training is designed to instruct people on ways to react and use the AED equipment in the event of an emergency. The college currently has 26 AED devices located in buildings across the campus including the Ag Complex and the sports venues. “Any lay person can stop the bleed, do CPR or any other training and they can call 911, and the dispatcher can tell them the training over the phone as well, and if you have a working knowledge of it, then you will know what you’re doing,” he said. Those who participate in the training will receive course completions in both CPR and Stop the Bleed. Debbie Strong, associate professor of art, was among a group of employees who participated in the first class held in early February. Strong, an Army veteran, said the class offered valuable training that everyone should learn. While the class will provide some employees medical emergency training for the first time, others are using the course to update their skills. “I thought I had been through all the first aid training in the past, only to find out the Stop the Bleed training is a new approach to old ideas,” Bob Hedges, criminal justice professor, said. While the current training is only being offered to employees, VanBibber said he hopes to eventually offer the classes to students as well. “My goal is that everyone who gets a diploma, certificate, or degree from this college will know the training and have the certificate,” he said. VanBibber encourages all college employees to register for one of the upcoming trainings scheduled for March 22, March 29, April 19 and May 3. His goal is to make sure that there are individuals on campus who will be able to offer medical emergency care when situations arrive. Those who have taken the course say they feel better prepared to lend a hand if they are ever needed. 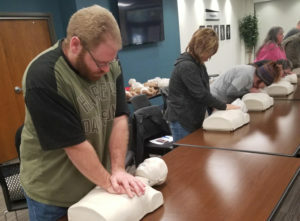 “It’s been years since I’ve had any of this training, and just like everything else, over the years there are updates and changes to best practices, so it was good to be updated on the newest first aid techniques,” Brandon Glade, funeral service education instructor, said.